If you have been wishing for a more minimal user interface for Google Reader, or are simply a fan of Helvetica, you’ll be installing this if you haven’t already! 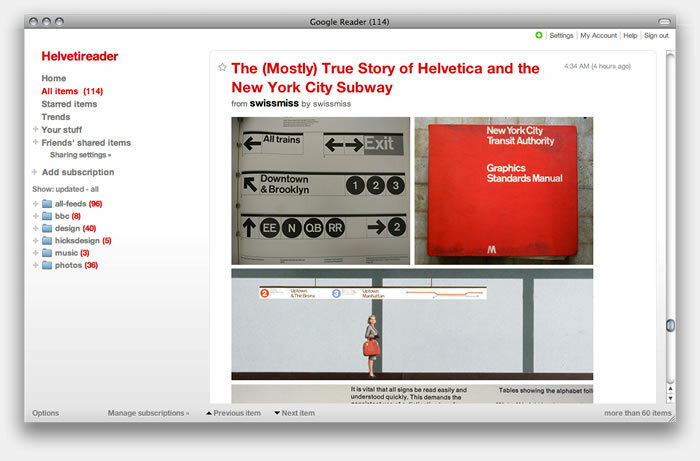 Helvetireader is a userscript that pares down Google Reader to the essentials. In particular, it’s made for looking at feeds in the expanded view, using Keyboard Shortcuts instead of on-screen buttons. It’s not going to suit how everyone uses Google Reader, so you can take the CSS and personalise to your hearts content! All you need is a browser that supports userscripts, such as Firefox or Safari and, of course, Helvetica. Visit the Helvetireader website for more information.